Though some political parties which got their nomination lists rejected backed Independent groups, members of the elected Independent group could not be replaced by members of any other political party, the Election Commission (EC) said yesterday. 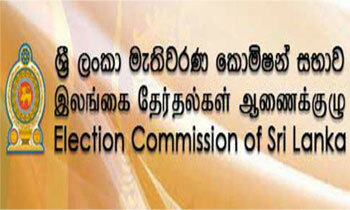 The commission made this statement in the wake of Sri Lanka Podujana Peramuna (SLPP) which got its nomination list rejected for Maharagama Urban Council announcing that it backed an independent group for the UC. Additional Elections Commissioner, Saman Sri Ratnayake explained that no candidate could resign from contesting until the election is held. Nobody knows what the fools, who are not even able to fill in a form, have for crazy ideas. what will happen If all the candidates in the list were resigned? Yes, people know this macko. Although you are trying to discourage voters who deprived of the will to vote pohottuwa voting for independents in order to suppress unp and slfp getting more votes, they will never vote for these two parties and they would like to see independents coming into power instead these two good for nothing two parties. Its the duty of the elections commission to educate the people on the new system.It has all the power to do so. If you fill up the electoral registration form distributed annually to your household erroneously and if you fail to gain registration Who is at fault,You or the Election Commission ?Its just the same.The answer is simple. Why can not join those independent groups with Sri Lanka Podujana Peramuna after winning ? If defeated MP's can enter the Parliament throgh national list and bear Ministerial posts, Why can't rejected member;s of a LG poll? They only rejected by the officials in your dept. not by the people of this country Macko. They were rejected by the election officials because they could not fill up a simple election nomination form.Can these people addministrate a city or village ?